Tattoo Designs: How to Choose the Right One for You! Want to get inked but have no idea what to get? Browsed hundreds of designs but haven’t found the right inspiration? Well, how about trying to do this a different way – what inspires you most? What do you really love that brings you joy? When selecting your perfect design, ask yourself – what does this design mean to you? Your chosen tattoo design could be anything from an animal that represents you to an object that reminds you of a memory, to a portrait or name of a loved one or a sketch of your favourite things. What you choose as the subject of your tattoo is only limited by your imagination! But sometimes, a little help doesn’t hurt! Check out our list of the various kinds of designs you choose to get inked! The arts have inspired people for centuries. The creative inspiration that flows through the arts has given us some of the greatest masterpieces in existence. Getting what inspired you inked is a fantastic way to carry that bit of inspiration with you wherever you go! Antique objects are beloved because they evoke a sense of nostalgia for ‘the golden ages’ of artistic expression. These objects can be anything from boomboxes and cassette tapes of the 80s, to gramophones, telephones, and typewriters of the early to mid-1900s – or perhaps something even older! Love old-school but want to update it a bit? Check out this awesome tattoo of the Awesome Mix Vol. 1 tape from the Guardians of the Galaxy! Are we Starlords? Or are we 80s kids? With the development of the neo-traditional style of tattooing, artists began looking far beyond their usual subjects for inspiration. For some, they found it in nature while for others, the concrete jungle was their muse. Now, blueprints, buildings, and other architectural marvels have become quite popular as tattoo subjects. The fine arts have given us some of the greatest pieces of art history has ever seen. The earliest styles of drawing, painting, sketching, and sculpting – among various other forms of art! – continue to inspire us even today. While they have inspired entire styles of tattooing, they also make for very interesting subjects – such as Van Gogh’s Starry Night and Dali’s whimsical surrealist pieces in tattoo form! The best part about getting a piece of art tattooed is being able to customize it so it becomes a piece that’s uniquely yours! For instance, ‘The Persistence of Time’, one of Dali’s most notable works, has been reworked numerous times in tattoo form. It’s not just the art itself that inspires – sometimes it’s the artists themselves! Popular artists including Dali and Gogh are often the subjects of tattoos. The master painters of the past, such as Michelangelo, as well as revolutionaries whose very existence changed the world, such as Frida Kahlo, are some of the most popular subjects for tattoos. Are you a fan of Harry Potter? Or perhaps Alice in Wonderland was more your scene? Or maybe your imagination takes you all the way back to Shakespeare or Poe? Getting the characters, a scene or location, a book cover, or even a quote inked is a very popular way to carry the stories you love around with you – so you never forget the magical journey that taught you so much! Are you a fan of culture? Whether it’s the aesthetic, traditions, or even cuisine of another culture you adore, you can get a beautiful design customized to express your love. Tattooing styles like Irezumi and Tribal are extremely popular and often feature cultural elements and history in their designs. Just remember to be respectful when you take things from another culture! Some cultural art must be done by a master from within that culture itself, as these tattoos hold a sacred space in these cultures and must thus be done with the appropriate tools while maintaining tradition. One can, however, customize a design inspired by these traditional and cultural styles and combine them with other forms of tattooing. Read: Tribal Tattoos: Traditional and modern inks to inspire you! Music-lovers – we wouldn’t forget you! Express your love for music with anything from album art of your favourite band to lyrics of a song that means the world to you, to a portrait of your favourite musician or even bits of sheet music! In our ever-changing world, labels often change and grow to reflect the times. Gender tattoos are often a very personal way of affirming one’s identity to themselves. Whether you identify as the gender you were born as or not, whether you identify within the binary or not, and no matter what your orientation, tattoos are a great and often intimate way to remind yourself to stay strong and true to who you really are. 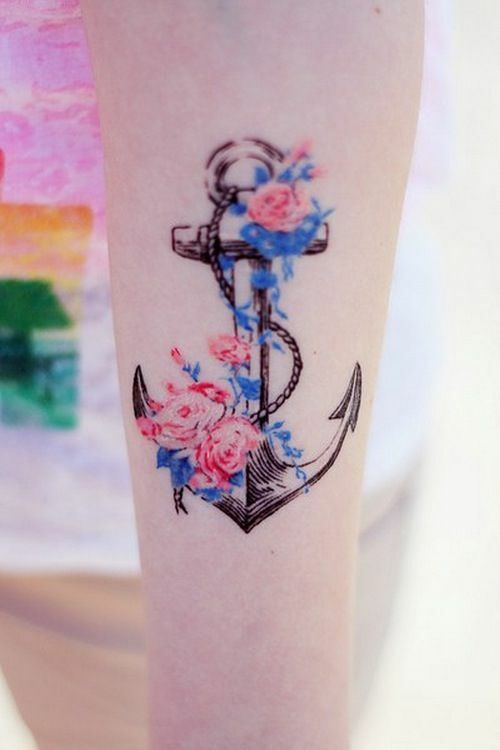 Anchors represent steadfastness, strength, stability — and being trans in the modern world. Have a passion that you KNOW is your life’s purpose? Something you love more than words can express, more than life itself? What could be a better subject for a tattoo than that! Many people find the space to be truly magical – with all its mysteries and everything we haven’t discovered yet! For some, it’s a love for astronomy, and for others, it’s a reminder of everything in this world that is both large and small – all at once! Abstract and blackwork tattoos featuring planets, stars, galaxies and beyond are breathtaking – and definitely as magical as the worlds we are yet to see! Together, even when we’re far apart! Your love for astronomy could also feature sacred geometry, which uses geometrical patterns to depict the interconnectedness of all life – across the universe and beyond! Hey there party-animal! Do you love a good scene? Are you always the last one to leave a club? For the life of the party, a party is full of life! The joys of being part of a crowd, of the music and drinks, of good friends and good times are often what it means to feel alive – and also make for some great tattoo subjects! 80s party chimp livin’ it up! A good time doesn’t always have to be a wild night out! You can also celebrate the quiet evenings at home, sipping on some good tea, or maybe a soiree or kitty party is more your style? Anyone up for a kitty party? Don’t forget the tea! Or maybe there’s a specific party you’d love to be at – like one featuring your favourite characters and friends? Do people fascinate you? Are you someone that loves getting to meet new folks, or perhaps you find enjoyment in people-watching and learning about human behaviour? Maybe there’s a specific person, group, or event that inspires you? Whether you get a simple line tattoo or a hyperrealistic portrait, you have no shortage of tattoo subjects to choose from! Portraits don’t always have to be traditional though! You can spruce it up a bit with a modern style, such as a glitch tattoo. History is but an ode to the ones who came before us! If your passion involves a camera or a tablet, you’ll find there’s a world of stunning tattoo designs to choose from! From abstract and trash polka designs to geometric tattoos featuring photos to hyperrealistic tattoos of cameras, tattoo designs using this subject are some of the most beautiful to look at. And what’s great about them is they work in any style! Tattoos also often use designs similar to what photographers and designers might create in their art, which means you can take what you love and combine it with all kinds of subjects! Cricket, football, golf, hockey, rugby, surfing, tennis….what’s your style? Get the crest of a team inked, or maybe you’d prefer getting a design featuring the equipment? Rep your love for sports with the perfect tattoo! Sketch-style tattoo of a child’s dream – to play football! Wanderlust! We’re all enamoured with travel. Some of the most popular travel tattoos include subjects like maps and vehicles – ships, boats, cars, bikes, and even hot air balloons! Have a case of wanderlust? Grab your person and hit the road – to your nearest tattoo parlour! But travel tattoos also include things like the birds swallows – confused? Well, a fun fact about travel tattoos is that they have their roots in nautical tattoos, popularized by British sailors way back in the 1800s. And swallows symbolized sailing experience! Many people get tattoos to remember something or someone special to them. This could be anything from a portrait of a loved one to a tattoo of a landscape to remember your favourite place or memory, or even a seemingly random object that actually holds a very special meaning to you. Anatomical tattoos are realistic designs that use human body parts, including organs, as the subject. For some, these tattoos are a reminder of a major life event, such as an anatomical bone over a body part you fractured during an accident. For others, these might be more philosophical, such as anatomical brain and heart tattoos to represent the question ‘do you lead with your head or your heart?’. It might be odd to think of getting food or drink tattooed, but they’re surprisingly popular! For some, it might be a pop-culture reference – think Homer Simpson and a donut! – while for others, it might actually have a very deep, personal meaning, such as an icecream cone that symbolized childhood or a specific dish that you often shared with a special someone! We all need a helping hand now and then! No, we’re not kidding! Get an ice cream cone tattoo if you love it enough! Anyone up for some black coffee? If you’re a little quirky, you’ll love this dolphin emerging from a banana peel! Share your mutual love for anime by getting matching Spirited Away tattoos! Pinky swear – to stay BFFs forever! One of the most popular tattoos that holds a lot of personal meaning is to get a dedication to your parents in ink! This could include their names or initials, birthdays, portraits, or symbols you associate with them. Of these tattoos, the ‘maa-paa’ script tattoos tend to be the most popular! You can also go with basic scripts and classic designs, such as an English ‘mom’ and ‘dad’ with an infinity symbol. Want something a little different? Try a photograph! Portraits are also a very popular kind of tattoo for dedications to a loved one. Have a furbaby that’s the love of your life? Get a gorgeous tattoo featuring them! While old-school tattoos drew inspiration from pop-culture and the cultures that sailors encountered, tribal and neo-traditional styles drew heavily from nature and featured subjects from the world around them. Modern tattooing takes cues from everywhere, with nature being a prominent source. Probably the most popular of all subjects, animals remain a favourite across the tattoo industry. While for some an animal might hold personal meaning, for others each one represents something unique – a concept that goes back to the early tribal forms of inking. The elements have been used as tattoo subjects since the earliest tribal styles. While they represent nature, power, and the changing weather, each one also represents something unique – such as water for emotions and healing, and air for peace and serenity. Tattoo designs often combine the elements with other subjects, such as the sun or the moon and a night sky. Sceneries can often be so stunning that we can’t help but stop and stare. So naturally, they are a very popular subject for artists – tattooists included! Whether it’s a city skyline or a sandy beach that takes your breath away, it’s probably going to be just as gorgeous in ink! Trees, flowers, shrubs, seeds, fruits – so many subjects to choose from! The neo-traditionalists were particularly interested in flowers and featured them heavily in their designs. Floral patterns continue to be popular across many styles of tattooing. While some might shy away from topics like politics because they can get very controversial and even emotional, for some it is a very important part of their lives. Their views and beliefs shape who they are, and this can often make for some stunning tattoo art! Whether you have served or simply respect those who have, a tattoo design featuring a tribute to the soldiers that lay their life down to protect their country is a great way to express your patriotism! Combine your patriotism with some classic tattoo designs! Are there certain causes you are extremely passionate about? Or perhaps you belong to a community and would like to represent your solidarity? You can choose from a range of tattoo subjects – from tattoos that show allyship to ones that represent mental health issues and struggles to ones that celebrate pride and the LGBTQIA++ communities. The sci-fi genre has inspired us for decades – from Ghost in the Shell to Alien to Terminator! Within the tattoo community, the sci-fi genre inspired a new style within hyperrealism – that of the gorgeous 3D biomechanical tattoos, full with robotic body parts and metal gears and pistons that appear to sit just below the surface of the skin. Who’s your muse? Whether you’re into Hitchcock and Tarantino or Disney and Nickelodeon, opera and classical music or RnB and pop, if there’s someone who inspires you or whose work you really enjoy – that’s your perfect tattoo subject right there! If there’s a specific character or story that has moved you, or maybe a game or quest that excites you – put it in a tattoo design and express what you love! Historically, the Egyptians inked religious symbols on the dead so that they would pass into the afterlife smoothly. It was thought that these symbols would give them important information once they were on the ‘other side’. Later on, religious tattoos were a way for individuals to escape persecution by identifying themselves as devout Christians and not Roman spies. Over time, tattooing religious symbols has become less of a symbol of devotion and a lot more to do with one’s own connection to the design. If you love tattoos then you’ve definitely seen at least on Buddha tattoo in your life! Deities are often featured as subjects in tattoos for various reasons, including faith and devotion, a love for ancient tales, and even a feeling of being personally connected to a specific figure in religious texts. Be careful though – some deities must never be tattooed, while others are restricted to certain body placements, so be sure to do your research before getting a deity inked! Mythology exists in all ancient cultures – Greek, Roman, Egyptian, Indian, Middle Eastern, and many more! These stories have inspired art for centuries, often told and retold to every generation by way of books, movies, television, and song. Which makes it understandable why these stories, characters, and mythological creatures remain a popular subject for tattoos! Of mythological creatures, dragons in all forms tend to be the most popular. Religion and spirituality are often at the core of our beliefs and values, usually playing a big part in how we were raised. The symbolism in these stories and scriptures often feature prominently as subjects in tattoos because of how much they shape us. Many tattoos use such symbolism, though sometimes they draw on inaacurate representations! Celtic symbols are some of the most popular when it comes to finding personal meaning in symbolism. These designs feature interlocking patterns that appear to create ‘knots’. Besides these symbols, tattoos with Celtic designs also feature animals, each with its own unique meaning. While getting an actual Native American person tattooed is often considered offensive – because the designs are usually factually inaccurate! – there are many parts of this culture that are beautifully symbolic. Some of the most popular tattoo subjects are dreamcatchers and animal totems. Traditional and tribal Native American tattoos are equally stunning but must be bestowed by a master tattooist from within the culture. So while it would be disrespectful to get these if you do not belong to the tribe, you can still find inspiration in the deep meaning behind them. Sacred Geometry is a branch of spirituality that uses sciences and mathematics to explain life, simply by finding repeating patterns that exist across all living things. These patterns often make for some stunning tattoo designs, usually ornamental and abstract in nature. Some popular ones include the Fibonacci sequence, mandalas, and parts of larger patterns including the tree of life and the flower of life. Honeycombs represent life’s sweetness, the heart chakra, warmth, light – even the cells of the matrix! ‘Witchcraft’ often gets a bad name due to its portrayal through TV and movies, but Wicca is actually an ancient spiritual art that has inspired much of the modern spiritual movements. Closely linked with Celtic subjects, symbolism from within the ancient craft including precious gemstones and crystals, symbols such as the Triquetra, and divination tools such as the Tarot or crystal balls are often featured as subjects in tattoos. Know what you want to get inked? Head on over to jhaiho.com and book your tattoo appointment today! Next post Tattoos & Piercings: A match made in heaven!